Text Thickness–Find the binder ring diameter closest to the diameter recommended by our capacity guide. A diameter significantly higher than the recommended capacity can expose the rings to more stress due to instability. A diameter that is too low can lead to damaged pages. Humidity Levels–Consider the usage and storage environment of the QRH. The AERAD binder’s material and ring thickness are best suited for humid environments; The Aerobinder’s material and ring thickness make it more resilient in dry environments. With that in mind, I’ll be referring to our online capacity guide. This guide is designed to help you decide what diameter of ring you need for your manual based on the text thickness you are working with. When you look at the chart, you will see that there are two different sections; one titled ‘AERAD’ and one titled ‘Aerobinder.’ Under the two headings are a lot of measurements that are the same size, but one section is in Metric and the other section is in Imperial units. The first distinction between the product lines is this measurement difference. 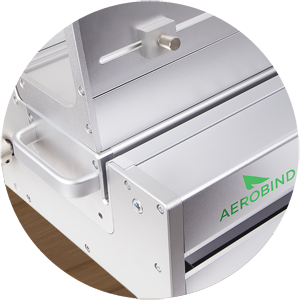 Some Aerobinder II binders are identical to the AERAD sizes; such as the 1-inch Aerobinder II and the 25mm AERAD, and others are exclusive to that product line it belongs to. These include binders like the 63mm AERAD and the 1.25 inch Aerobinder II, which have no equivalent sizes in the alternative product line. 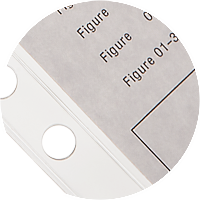 Users of the AERAD binder may find that especially for larger manuals, pages turn easier due to the flat ring shape. The Aerobinder II, however, has a thicker ring that provides stability to the book itself. The differences are minimal, and we’ve found that most users develop a preference based on what feels best to them as individuals. When you are ready to pick your binder, visit our AERAD page at aerobind.wpengine.com/aerad or our Aerobinder II page at aerobind.wpengine.com/aeroii. If you have other questions about our products or need more detailed specification, see our customer resource page at [tech specs link]. AERAD and Aerobinder II: What’s the Difference? What’s the difference between the AERAD and the Aerobinder II? A lot of customers have asked us that question, and in this issue of By Design I hope to shed some light on a few of the differing mechanical properties of the two product lines. Hopefully this information will help in your decision to purchase your next QRH binding system. In many ways the two product lines are very similar. Ring spacing and ring diameter are fairly consistent between the two designs and they both operate in identical fashions. The differences between them can be found in the material and ring design. When designing these product lines, we wanted to offer two distinct options to meet the needs of any user. This led to supplementing the already well-adopted AERAD product line, with its flat thin ring, with the Aerobinder II product line. 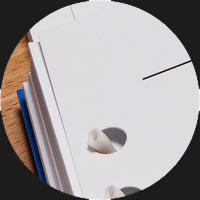 The AERAD’s ring allows for optimal page turning while the Aerobinder II’s ring design is more circular, (see Figure 1) which was intended to make the binder more robust and increase the longevity of the plastic. While we have noticed a slight decrease in page turning functionality, the difference is not noticeable in most situations. Additionally, another difference, though slight, is found in the plastics used to manufacture each product line. The AERAD is manufactured with a less ductile Nylon 66 resin than the Aerobinder II in order to stiffen up the measurably thinner, flat rings. Because of the resin used in the AERAD and because of its thinner design we recommend storing it in a humid environment. Both product lines are intrinsically hygroscopic–hygroscopic materials attract and hold water molecules from the surrounding environment—but because of the Aerobinder II’s rounder, thicker ring design, it is more resilient in colder, dryer storage environments. Either product can be a useful addition to your manuals. The important thing to keep in mind is your text thickness, and your usage and storage environment. For more information about how to choose a ring binder, see the “Checklist U” section of this issue’s Aerobind News.